Round Up from the CSL's weekend action! U.S. amateur champions Lansdowne Bhoys are back in the Manning State Cup final after blanking Central Park Rangers 2-0 at Tibbetts Brook Park. Early pressure in the semi-final by forwards Ovan Oakley and Mamadou Guirassy forced a CPR own goal after four minutes. The visitors could have been three down with a shot coming off a post and another effort scrambled off the line. German midfielder Michael Holzer then produced a “goal of the season” contender with a powerful volley from some 30 yards making it 2-0. The second half was goalless, albeit the Bhoys had plenty of chances while CPR’s attempts to break down the Lansdowne defense failed with Sean Kelly, Ciaran McGuigan, Craig Purcell and Jean Voltaire in top form. “Despite an own goal in the first minute, a depleted squad missing six players fought well, but were ultimately second best,” conceded CPR player-coach Eli Vovsha. 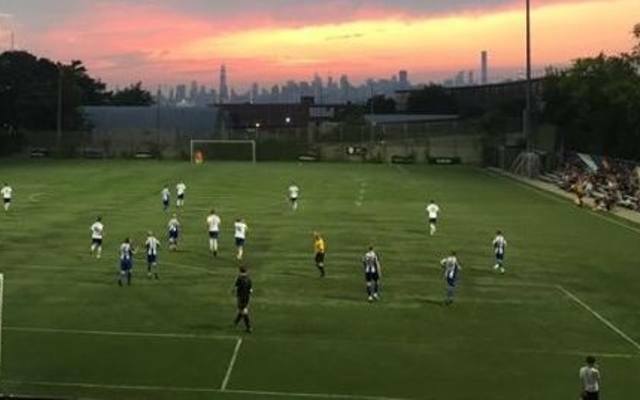 Lansdowne’s opponents in June’s Manning final will be the winner of the delayed Hellenic derby between Pancyprian Freedoms and New York Greek Americans. Three weeks after ending Lansdowne’s unbeaten record in the CSL this season, Cedar Stars Academy produced an encore performance of sorts, blanking Pancyprian Freedoms 3-0 to hand the Greek-Cypriots their first defeat of the campaign. “Twenty-one-year-old phenom Walter Calderon scored the first two goals on assists from Maxi Garcia,” reported CSA owner-coach Oliver Papraniku. Chris Katona then sealed an emphatic victory at Montclair State University with a superb individual effort, dribbling the goalkeeper after slaloming through the defense. “Pancyprians were very strong and had a lot of the play in poor conditions. Bryan Lopez made two key saves in closing 20 minutes that [preserved] the shutout,” said Papraniku. It was the only league match in the top flight and the result saw CSA reclaim first place from Lansdowne on goal difference. Both are 9-2-1  with five matches to play. In the second tier, Hoboken FC remain unbeaten atop the South standings following a 7-1 shellacking of Panatha USA at Laurel Hill Park. Two-goal hero Cory Chaplin [18th, 45th] opened the scoring. Zach Kraft [28th], Tom Hogue [38th], Bobby Dye [60th], Jeremy Witherspoon [78th] and Jeff Natale [83rd] also tallied as the Jersey side [10-0-2, 32] went six points clear of second place Polonia Gwardia. Hoboken’s runaway reserves -- matching their first team win for win and point for point -- cruised to a 4-1 victory over Panatha ‘B’ to improve to 10-0-2  as well. They are now 11 points ahead of closest pursuers Williamsburg International. Gleb Mironenko [9th], Sam Omosuyl [23rd], Alex Wallin [32nd] and Jeff Natale [78th] connected. “Good results all round,” said Hoboken GM Bill Marth. Stal Mielec’s second unit held off CD Iberia ‘B’ 4-3 in a hard fought affair on Randalls Island. Jacek Korba [two], Marcin Kieler and Lukasz Sowinski were on target for the Poles. Javi Beiro, David Lijo and Javier Mejia scored for Iberia. Steve Kovalenko’s New York Ukrainians put their league woes behind them once again to thrash the EDSL’s El Salvador 4-1 and reach the Flamhaft Cup semi-finals. Anatolliy Tatarin [pen. ], Adam Maliniak [pen. ], Gamil Yahya and Yosef Alrobay starred for the CSL envoys, who’ve won just twice in the league. Standing between Ukrainians and a place in the final are Williamsburg International, 2-1 victors over Manhattan Celtic in that quarterfinal match-up. Mark Gallagher set up both goals for John Kaddo. Also in the Flamhaft Cup, Rapheal Ramos Meyer had the only goal in the CPR Reds’ 1-0 decision over NYPD FC. The Reds meet Second Division rivals Brishna in the last four. Triumphant in the 2009 competition, New York Athletic Club ‘B’ stormed back into the D’Arpino Cup final with a 5-0 drubbing of the Pancyprian reserves. Junior Spinks and John Stamatis did most of the damage with a brace each. “Jon Hemmert scored a PK as we finally found our finishing form,” noted coach Bill Saporito. His men face 2014 cup winners New York Greek Americans ‘B’ for the Cup in June. The Greeks also swept past Manhattan Kickers 5-0, after the latter had blanked Manhattan Celtic 4-0 four days earlier. Almir Hot struck twice in that game, and Tommy Herlihy and Fabrizio Lepiz once each. Rodolfo Domingues and Mathias Jorge had assists. David Anderson was Kickers’ Man of the Match. Niels Kirch hit a hat trick while Gearoid Kennedy and Sean Kelly had a goal apiece in the Lansdowne Metros’ 5-0 rout of weary NY Galicia on Randalls Island that clinched them a semi-final berth. It was Galicia’s second game in less than 24 hours. On Saturday night, the Spaniards had registered their own rout, 5-1 over FC Partizani in a Metro Two fixture. Jose Olarte [two], Ricardo Garcia, José Campoverde and Alexis Escobar scored. Lansdowne’s foes in the last four are the LISFL’s Guyana Juniors who knocked CSL Metro side AO Brooklyn 5-2. Paddy McCarry’s Shamrocks, cup winners two years ago, qualified for their third straight Marth semi-final with a 1-0 win over Port Jefferson on Long Island. Veteran Bingo O’Driscoll converted a 50th minute penalty for the decider. The spot kick was awarded after skipper Mark Finn’s shot deliberately handled by a defender. McCarry & Co. made history in 2016 when they beat 10-time holders Baisley United 4-2 in the final to become the first CSL side ever to win the Marth Cup. The Shamrocks first team also advanced to the semi-finals of a competition, blowing out Beyond FC 8-0 in the Kilby Cup quarterfinals. Center forward Travis Blair connected four times. Dan Giorgi [pen. ], Kurt Cameron, James Whyte and Calvin Moyes also chipped in. In a mouthwatering match-up, the Shamrocks square off with fellow First Division side Doxa FC in the last four. Emgi Gousse, Fernando Cortez [two] and Ibrahima Bah steered the Greeks past Zum Schneider in the quarters. CPR evicted NYGA’s second unit 3-1 after Faissal Sanfo had set up Lulu Binabbas’ first half opener. Further goals by Vitaliy Firsov, who nodded in a Donje Green corner, and Clint Dunn, thanks to Lulu, saw off the Greeks. NYAC, meanwhile, routed the Shamrock reserves 5-1. Peter Ceesay, Carlo Zanetti [two], Alex Billington [pen. ], and Andy Hickey scored for NYAC. In a showdown between two high scoring teams, Kelmendi, powered by former Albanian pro Glorian Hoxha, demolished Williamsburg ‘B’ 11-0 to secure a semi-final berth in their rookie season. Hoxha got a modest two goals – by his standards; Valdrin Lekocaj added a deuce, as did Ylli Sufaj, with Anton Lekocaj and Ylli Tinaj each on target once. Top scorer on the day was the veteran Naim Kurtovic with a hat trick. “It was 5-0 at halftime. To our credit, we tried to play out for the entire game. Kelmendi were athletically and technically gifted. No shame in going out to them," conceded Doylies coach Augustus Esgro. Also in the semis are the Ukrainian reserves, thanks to Kassim Alkasimi’s strike in a 1-0 decision over the Shamrocks 1960. Holders Manhattan Celtic Legends bowed out 4-3 on penalties to Manhattan Kickers Premier after a 2-2 tie in regulation. Celtics’ Sam Bowman and John Tanios exchanged goals with Filip Loncar and Nick Bill in the 90 minutes of play. But it all came down to Seamus Kelly’s winning PK – the fifth in the shootout -- for Kickers. Mike Fitzgerald & Co., however, face another Celtic hurdle in the semis, in the shape of Manhattan Celtic Bhoys, who were runners-up to Legends last season. The Bhoys prevailed 2-0 in their Irish derby with Shamrock Legends, courtesy of Adam Darter’s brace. Big winners in the Over-30 quarters were the Greek Americans with an 11-0 blowout of CPR Legends. Trying to halt the Greek express in the last four is another CPR side – Old Boys. The latter beat Barnstonworth Rovers Old Boys 3-2 in their last eight tussle. Brandon Levy, Ernest Subah and Bruce Adtween scored. In an Over-30 league game, Megas Alexandros hammered Brookyn Gunners 6-0.